By simple definition, ankle arthritis refers to the inflammation and degeneration of the joint surfaces which make up the ankle joint. As mentioned throughout this web site, arthritis, while having numerous forms and causes, commonly affects joint surfaces by breaking down the cartilage covering of the ends of the opposing bones. These surfaces include the end of the tibia (shin bone) and the “dome” of the talus bone, which lies just underneath the tibial articular surface. This is the main junction between the leg and the foot. 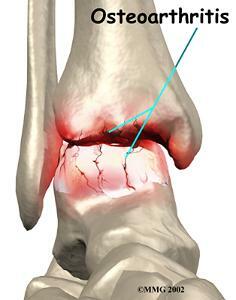 The inner portion of the lateral malleolus (end of the fibula bone) is frequently involved as well. 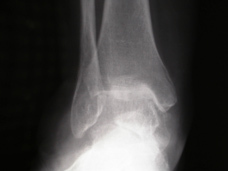 Most cases of ankle arthrits are the reasult of some kind of traumatic event, such as an ankle fracture, but can also result from prolonged obesity, repetitive impact from running or jumping sports, flat feet, and medical conditions such as Gout (high uric acid) where uric acid crystals are deposited into the ankle joints and, over time can cause arthritis "flare-ups" and associated degeneration of the joint surfaces. An interersting, and sobering, thought is that for every pound of body weight that a person gains, there is a 4:1 ratio in pressure on the weight bearing joints. Therefore, one pound of weight gain results in a 4-pound increase in pressure on hip, knee and ankle joints. As you can see in the above x-ray, the spacing between the shin bone (tibia) and the talus bone is gone, worn down. The "tread" has been worn off the proverbial tire. Once the bones begin to rub together like this, pain, swelling and mobility issues increase. Weight bearing can become difficult and uncomfortable. Many people will have a noticeable limp and have trouble wearing shoes due to the level of swelling and deformity that can develop.